Adelaide running circles around August. We haven’t introduced you to solids, yet, but that does not keep you from putting EVERYTHING in your mouth! Your favorite thing to “eat” is paper, especially paper towels. It breaks your heart when I pry the soggy pulp from your clenched fingers. You are still a good sleeper, but you have had some issues this month. There have been a couple of times when you did not want to go to bed, and days when you have skipped your nap. You have also had more wet diapers in the middle of the night than usual. You are now 22 pounds, 28 inches long, and your head is 17.75 inches around. That means you are still in the 95th percentile for weight, 90th for height, and 75th for head size. You got your first tooth this month—the bottom left front tooth. We’re still waiting to see the right one come through. You are almost crawling! You just need to figure out how to get up on your knees from your belly. You are great at sitting and bending over, and you can get from a seated position to a crawling position. But then you reach for something, fall on your belly, and use your arms to scoot around. You are also learning to cry for Mom or Dad, and how to reach out with your arms to be held. I was looking at you last night, Augie, and thinking about when you were in the womb, just 10 weeks old. After a troubling afternoon, I thought my pregnancy was over, that our time together had ended. I spent a whole day waiting to go to the doctor, convinced that you were gone. But when we finally got into the exam room, there was your heartbeat, flickering away on the screen. I was so surprised and so thankful for that little heartbeat. The day you were born, I could hardly believe you were real. But here you are, six months later, growing and smiling and laughing and bringing so much joy into our hearts. I am really thankful for your life, and I am blessed to be your mama. Big sister Adelaide is 3-1/2 today! Happy half birthday, Laidey! Under the blankie. I liked the dots of light on his face. Adelaide’s new thing: being a baby. It started with wrapping herself in Augie’s blankets and wanting to be held. Then she started wearing his diaper covers. Today, she is wearing all of his clothes. Last night, I was eating cashews, and she wanted some. I said, “But babies don’t eat cashews.” I thought she would snap out of it and say, “I’m a big girl!” but no. She stuck to her babiness. Then I felt kind of bad for not giving her cashews. Anyway. I think it’s kind of weird, but I kind of get it, too. I mean, it’s fun to be a baby. Babies get lots of cuddling and attention. It’s just a phase, right? And yes, her hair is indeed shorter, thanks for noticing. Yes, she cut her own hair again. Yes, I have learned my lesson. Augie cut his first tooth last night! I had been feeling for a tooth for weeks. He has been so drooly and a little fussier than usual. I even checked on Saturday night—nothing. 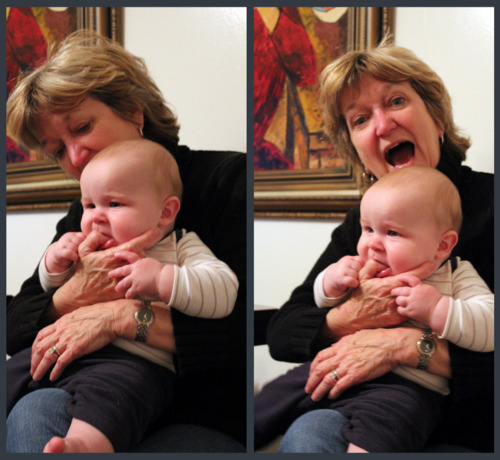 But Grandma Cindy found one little sharp tooth poking out of his lower gums. Hooray!